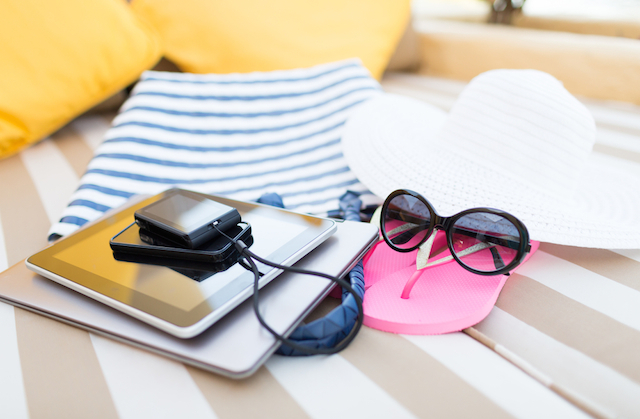 Gadget insurance: Are your electronic devices covered on holiday? Many of us bring expensive gadgets on holiday, whether it’s a mobile phone to keep in touch with people back home, a camera to capture special moments, or a tablet to keep the kids entertained. But by packing even a couple of gadgets, you could very easily find yourself carrying over £1,000 worth of hardware on holiday. If one of your gadgets is lost, stolen or damaged while you’re away, the cost of your holiday could really add up. Most new gadgets come with a manufacturer’s warranty, but this will only cover you for mechanical breakdowns, and usually only for the first 12 months of ownership. A manufacturer’s warranty does not provide cover for accidental damage, loss or theft — so you’ll need to cover your gadgets elsewhere if you want a replacement without ending up out of pocket. Are gadgets covered on your travel insurance? If you’re planning a trip abroad, you’ve probably already taken out travel insurance — this is wise as it can provide valuable protection for healthcare and if your holiday does not go to plan. But you shouldn’t rely on your travel insurance policy to cover all of your possessions, especially if you’re bringing expensive gadgets on holiday with you. While most travel insurers offer a generous payout for lost baggage, you could be subject to a limit of as little as £100 to claim back for a single item. With some modern smartphones costing upwards of £500 and high-end cameras even more, it’s unlikely you’ll be able to claim back enough for a replacement on a standard travel insurance policy. Are gadgets covered on your home insurance? If you have personal possessions cover as part of your home insurance policy, you may be able to claim for loss, damage or theft of your gadgets while on holiday. Personal possessions cover is not automatically included with most home insurance policies, so it’s unlikely you’ll be covered unless you’ve specifically requested it as an add-on to your policy. If you do have personal possessions cover and want to use it to protect your gadgets on holiday, it’s best to check with your insurer whether you’re covered while abroad and how long this is valid for. If you want your gadgets to be covered for accidental damage, you might have to pay extra to add this to your policy. Before relying on your home insurance cover to protect your gadgets on holiday, you should consider the excess applicable to any claims, and bear in mind that any claim for a gadget might cause you to lose your no claims bonus and affect the price of your entire home insurance policy. If you want to protect your gadgets while you’re on holiday, you could consider a standalone gadget insurance policy with worldwide cover. Gadget insurance covers all the hardware you might take on holiday with you, including mobile phones, cameras, tablets laptops and smart watches. Plus you can cover your home-based gadgets such as TVs and games consoles. Gadget insurance policies from providers such as Protect Your Bubble are separate to your home insurance, meaning you won’t be charged more after making a claim. The excess you pay for a claim could be cheaper too, at £50 for mobile phones (£75 for loss claims), and just £25 for tablets and other gadgets such as cameras. A good gadget insurance policy will cover you for mechanical breakdowns, theft, liquid damage and other accidental damage such as cracked screens, and you may want to consider adding loss cover for a small additional charge. Your gadgets will be repaired or replaced when you make a claim, and you should also be covered for any unauthorised calls or data made from your phone if it’s lost or stolen. Does Home Contents Insurance Cover Mobile Phones?